You are not alone! A fear of flying (aviophobia) affects about 1 in 5 people. Very often, weeks or even months before the flight, you will begin to fear that flight. Just the thought of it can lead to heart palpitations, sweaty palms and the mental rehearsal of all the things that could possibly go wrong on the flight! You might even be nervous about being in the airport itself. The bottom line is that you feel totally out of control, and you are terrified of your emotional reaction in this situation. As far as you’re concerned, you are in this metal container thousands of feet up in the air and your life is in the hands of that man with the nice, crisp accent at the front of the plane. You will probably already know that air travel is the safest form of transport there is. You may even know that your chances of being killed in a plane crash are merely 1 in 11 million and that you have more chance of being killed by a kick from a donkey. However, all this logic is disregarded as the emotions take over and the fear sets in. This fear can be anything from a manageable niggle but one that you would rather not have to suffer, through to a full blown terror response that interferes with travel plans and limits your life. A fear of airplanes may prevent you from going on holiday, or visiting friends/relatives abroad or it may restrict you in your career as you may avoid work-related flights. Different people fear different parts of the flight. Some people may have a fear of taking-off, others may have a fear of landing. Other people may just dread the bit in the middle! You become very alert to every little shudder the plane makes, every little noise you hear. And you spend too much time watching the expressions on the flight attendants’ faces, checking for signs of impending doom! 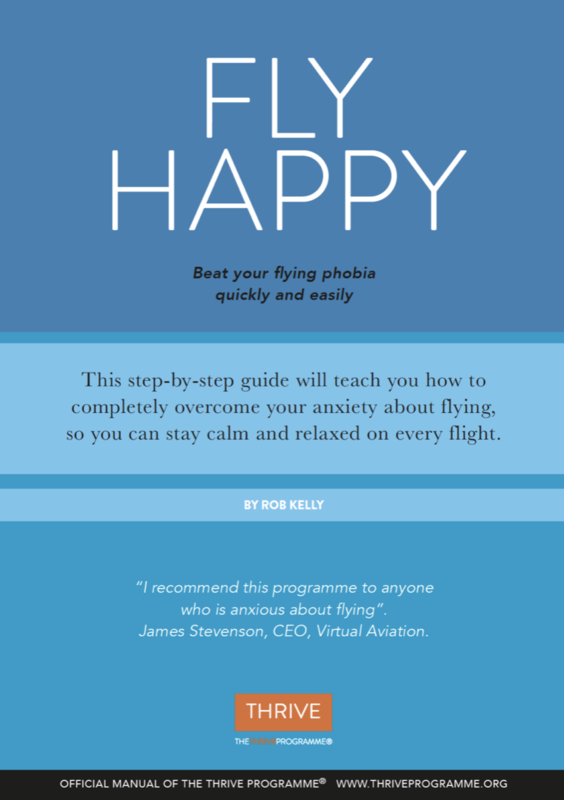 Many people experience some feelings of trepidation about flying, but if yours is overwhelming and you would like some help, the good news is that The Thrive Programme® is an excellent treatment for fear of flying. All phobias are the result of specific ways that we think about things. If we believe that we don’t possess the skills or resources to deal with a challenging situation, we can create a whole lot of anxiety about it. A fear of flying is the result of simple thinking errors, such as mis-using our imagination to expect the worst, perhaps imagining having a panic attack on the plane or the plane plummeting out of the sky. Thrive is a revolutionary and powerful training programme that helps you to understand yourself, your beliefs and your thinking styles that are causing your fear. Once you have that insight, it can be very easy to think differently, change old patterns of behaviour and feel back in control of your thinking and emotions about flying.